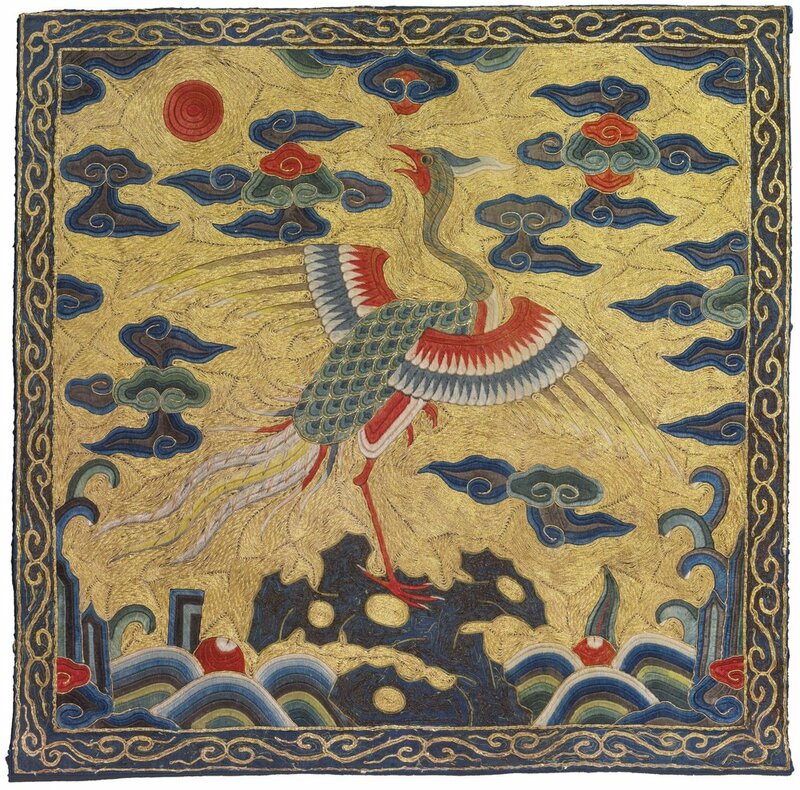 An egret rank badge (6th civil rank) from the Ming Dynasty (1368-1644), currently in the Cooper Hewitt's collection. Now treasured collector’s items, Chinese civil and military rank badges (the same system was later adopted in in Vietnam and Korea) once held powerful meanings that were instantly recognized in the culture of their time. This practice was rooted in the court attire of the Yuan period (1271-1368) but became fully fleshed out into a standardized system of identification for civil and military rankings in the Ming dynasty (1368-1644) when dress regulations were put in place in 1391. A lion badge (2nd military rank) from the 15th century, Ming dynasty. In the collection of the Metropolitan Museum of Art. Another lion badge from the Met's collection, late 16th–early 17th century, Ming dynasty. Although the look of the badges varied and evolved, their use for classification remained strong for hundreds of years, continuing into the early Republic of China. Badges from the Qing dynasty (1644-1912) can be recognized as differing from those of the Ming dynasty due to their smaller size and bordered compositions. Golden pheasant badge (2nd civil rank) from the Kangxi period (1662-1722), on auction through Christie's. Both the military and civil categories had nine ranks, first being the highest. The civil badges were all a series of birds, while the military used a wide variety of animals, including mythological beasts. Crane badge (1st civil rank) from the Qing dynasty, late 17th–early 18th century. In the collection of the Met. Tiger badge (4th military rank) from the LACMA. Silver pheasant badge (5th civil rank), late 19th century, Qing dynasty. On auction through Duke's. Society valued these rankings very highly, with boys essentially preparing for government examinations their entire childhoods—sometimes starting as early as three-years-old, depending on the standing of the family. Cornerstones of the society that remained standardized for centuries, the examinations valued rote memorization and were extremely competitive, with approximately only a 1% pass rate. Naturally, these badges were imbued with extreme levels of social power. Due to the fact that they were a huge source of pride for the family, women also sometimes wore badges indicating their husband’s rank. These can sometimes be identified by the red sun-disk woven into most badges: the men’s badges typically have the sun-disk in the upper left corner, while the women’s would mirror them in the upper right corner. Today, military badges are a rarer find than civil badges; when the imperial system was overthrown in 1911 to be replaced by the Republic of China, many destroyed their military badges to protect themselves from trouble with the new government. Civil rankings were merely adopted into the new Republic, so there was no reason for the civil badges to be destroyed. Leopard badge (3rd military rank) from the 19th century, Qing dynasty. Collection of the Met. Of the several weaving and embroidery techniques employed by workshops to create the badges, such as brocade, couching, and petit-point, kessi or k’o-ssu—a tapestry style meaning “cut-silk” that creates slits around interior shapes—is the most valuable. Along with their societal significance and spectacular renderings of the natural world and its creatures, the elegant mix of silk and metallic threads woven with a variety of intricate and painterly techniques is truly what makes these enduring objects for antiques enthusiasts. Pair of late 19th century Qing dynasty qi lin badges(1st military rank), on auction through Christie's.